It has been about two week now since Bender had his surgery. Overall he is doing really well. I had to take him back to the vet last week because the stitches on his foot didn’t look the best but the incision had closed up, it wasn’t infected, and it wasn’t bleeding so the Vet just bandaged it back up. Bender is getting back to his old self. Which means he is getting very restless. We haven’t been to the park in three weeks. No walks, no doggy day care. No playing with Luna. He couldn’t even play with my Aunt’s dog since they run around a lot. So every chance he gets he is trying to expel some energy. 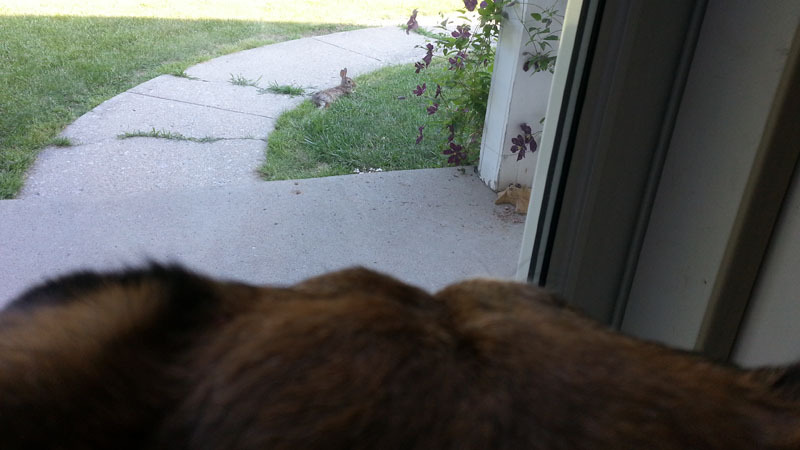 He is constantly running from the sun room windows to the front windows, looking for rabbits. Because of this he was tossing his bandage every few hours and why his foot wasn’t looking the best. We were bandaging his foot with gauze and then vet wrap. After visiting the Vet last week we were given Elastikon. It is similar to vet wrap but sticky. So we have been putting gauze over Bender’s incision. Wrapping it with Elastikon then with vet wrap so it is a little more durable. No more kicking off the bandage. Although let alone he will try to chew off the bandage so every once in a while he has to wear a cone. When Bender has been going outside we have been rubber banding a zip lock bag loosely to his foot. How ever this past weekend we knew we were going to be outside a lot and a plastic bag wasn’t going to do so we got him some boots. He ended up wearing a small but they are suppose to have a snug fit. With a little effort they fit over his bandage. Bender didn’t even notice and was happy to be able to run around a bit outside. The other issue we ran into was getting Bender to eat. It has been a chore. He is usually pretty excited about his food. His foot has him house bound, he isn’t able to do very much, so of course he isn’t very hungry. I tried the normal rice, some green beans, and a few food toppers but nothing worked. He was only eating 1/4 to 3/4 of his food. He was very nosy about some ground beef that I had cooked up so I drained the cooked beef and saved the juice and fat. Not exactly the best for him but it got him to eat. For each meal I would reheat about 1/2 tsp of the fat then pour it over his food. He would eat it right up. Throughout all of this his glucose has been pretty stable. I’ve also learned that he can go longer in between meals if he doesn’t exercise. Tomorrow we go back to the Vet to get all of his stitches out. At what time do you give him his meals? Do you space them 12 hours apart or the second feeding 6, 8, or 10 hours after the morning meal? The Difference: Type 1 vs Type 2 Diabetes in Canines.